0 Which blogging niche suits me best? As a blogger I dint had first hand information of blogging niche and all when I first started a blog. May be we dont need to know about it in the starting days of our blogging career but as you need to focus on the visitors of your page you need to be precise on the topic you choose. You cant cook your blog with almost everything. Your site should follow a niche in order to be categorized or noticed. You can have one particular niche or even multi niche blog depending on your caliber. So I thought of answering some self made questions which I missed while writing my first blog. Blogging Niche is not a usual term used but to define it we can say it is the topic of blog which we are writing. For example if I have a blog about food recepies, my Blog Niche is a Food related blog. So there are many Niches playing around for blogs. Food, technology, entertainment, news, software’s, etc. How to select a Niche? Now as you know what a niche means now the task is what kind of niche should I have for my blog. Simple I don’t suggest you to survey on top niches over the web but first realize that a top niche is within you. What ever ability you have start writing about it. Example you are good at cooking, technology, handwriting etc you can have a blog almost with any kind of niche. Niche is not limited to only few topics or so you can start a new niche also. 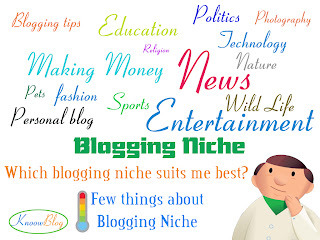 What will you do knowing them, don’t try to know which niche is top, if you select a niche which is already having lot of blogs then you need to write even creative posts to stand among top players so never ever look for top niche. Leave the top niche at its own risk. But of course if you are good at the niche which is already most demanding than you can blog with it but need to be different from others. What if my Niche is already used world wide? Yes if there are blogs related to your niche don’t get upset let it be their. All you have to do is look and see what they are not having in their blogs and you make those available in your blog. Their will be at least one thing which they might have missed look for that. Always believe you are just one post behind that blog which is already having many visitors. But don’t copy any of their articles. My niche is not so popular can I still have it? There is no such thing that is not popular only thing is we need to make it popular. Always we need to think about setting trends that’s what our main intention should always focus on. Are you having a unique niche for your blog that’s what world is eager to know about. We must always strive for bringing new things. Is your niche not a widely used niche then you make that niche a strategy, keep writing innovative posts and one day you will have your niche being top in this globe. I strongly suggest and motivate you, use only those niches which are new and even which are not at all popular that’s where you are unique. Using a niche which is already popular and top doesn’t make you top but can make you only one among the top. But a new and unique niche makes your blog even more popular.